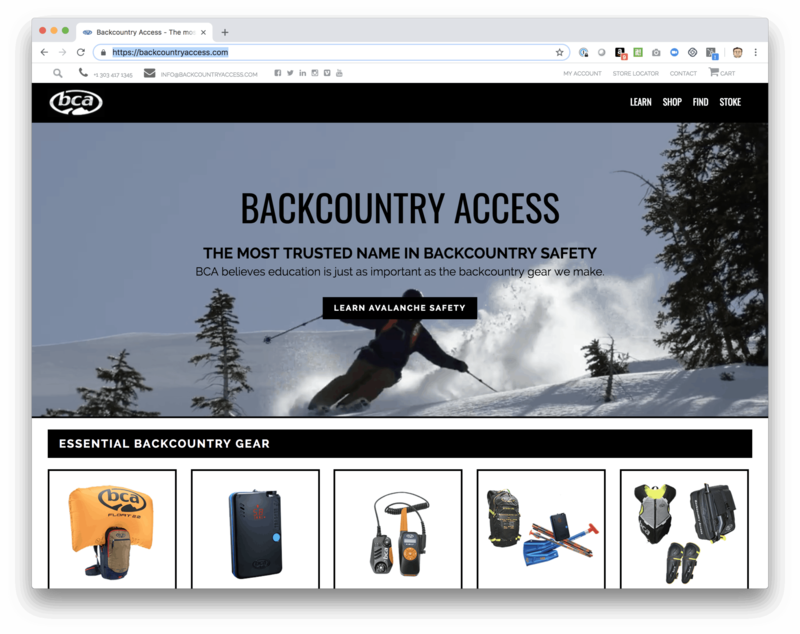 Backcountry Access, (acquired by K2 Sports in 2013) is North America’s leading manufacturer of snow safety equipment, including Tracker avalanche transceivers, Float avalanche airbags, BC Link radios, MtnPro protective gear, avalanche probes & shovels. Their mission is to save lives, not just sell products. They support avalanche education programs and forecast centers–and back up all their products with consumer education and knowledgeable customer service. For years, Backcountry Access (BCA) has used a custom FileMaker solution as a CRM to assist with efficient operations. BCA had a custom eCommerce solution written in PHP that was used to run the backend of their eCommerce website via the FileMaker Custom Web Publishing XML gateway — including inventory, products, and orders. As the company and orders grew, it put a strain on their custom solution and FileMaker server. Unable able to handle the load spikes during busy traffic seasons and special events, FileMaker becoming unresponsive was becoming an issue that needed a solution. This was especially a concern around the critical black Friday sales period when the FileMaker server often crashed multiple times causing lost sales. BCA contacted LuminFire for their expertise with integrating FileMaker and eCommerce solutions and our exclusive sync product BrilliantSync. Using BrilliantSync, which was designed specifically to reduce load on FileMaker server, LuminFire solved the problem of scaling and reliability and ported their online commerce functions to a WooCommerce website solution that maintained their branding and reduced the burden of maintaining multiple sites. LuminFire also with developed some customization of WordPress & WooCommerce to meet their special requirements due to their large user base and unique needs. LuminFire was able to assist with overcoming some major technical challenges. One such challenge was the extreme number of user accounts required to fully sync to BCA’s CRM. Our software engineers ended up modifying WordPress core better handle the tens of thousands of users. The changes we helped developed will likely become part of WordPress release in the near future to increase the scalability of the software. Other complexities included handling US and Canadian taxes, special shipping and handling arrangements due to the materials used in some products, complex discounts and pricing lookups based on user role, custom logic and routing based on partner traffic, localizing prices into multiple currencies, and handling payments with multiple processors that are captured after the sale by their parent companies’ ERP system. The BCA site made use of organic search by activity like ski, snowboard, fitness, bike, paddle, travel gear, hike, camp, surf, fly fish, run, climb, and snowshoe. We worked to maintain SEO (Search Engine Optimization) as well as flexibility so that all products could be found easily within the site and externally via Google searches. BrilliantSync’s design allows each platform to do what it’s best at without slowing the other down. WordPress can run at full speed with page and/or static caching without relying on communication with FileMaker to serve product or checkout pages, eliminating FileMaker Custom Web Publishing or the FileMaker DataAPI as a bottleneck. FileMaker can sync data with BrilliantSync without bogging down the WordPress site with queries/updates. BrilliantSync allows hosting WordPress on any suitable host, but due to traffic loads, BCA decided to use LuminFire’s Brilliant Web Hosting, powered by Pantheon which gives them a multiple server environment, a full dev/test/live workflow, source code management/release control, nightly backups, and a global CDN to ensure fast page loads. Just switching to LuminFire’s hosting platform cut their page load times in half! BrilliantSync runs on a multi-server, fault tolerant (geographically distributed, automatic failover) database cluster at Amazon Web Services (AWS). Even in the unlikely event that two parts of the system are down (FileMaker and BrilliantSync) WordPress can continue to serve users and take orders — once the system is back online the sync process “catches up” to the current state. In the end, BCA received a solution that let them use keep FileMaker as their backend in the office but also handle thousands of customers and requests on the public facing WordPress based frontend. It’s reliable, scalable and built on tools that will allow them to grow well into the future. LuminFire also completed the work in time for Black Friday 2018 so that all orders could be processed without FileMaker downtime.